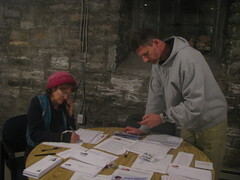 Joining other chapters throughout the state, Scott County KFTC members have been calling our members to ask them to renew their memberships or make a special donation for our Fall Fundraising Campaign. As of last week, we've managed to call through our chapter list, plus several other counties. Tomorrow night, a few Scott County KFTC members will be joining our allies at the Central KY Chapter to call part of their massive member list. If you'd like to join us, we'll be at 250 Plaza Dr, Lexington, KY from 6pm to 9pm. And if you'd like to donate to KFTC right now to help us in our campaign, you can quickly and easily donate online here. In other Scott County KFTC news, we have a chapter meeting this Thursday at 7pm at the Georgetown Public Library.